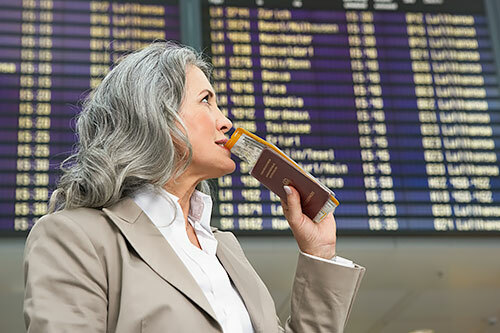 Whether you are an ESL speaker living in an English speaking country, or an ESL tourist travelling anywhere in the world, you need to look at the important situations in your everyday life and ask, “What do I have to do in the English language?” You may need to ask questions, to read signs or documents, to speak to people you work with or to your children’s teachers, or maybe you need to write messages or emails in the English language. On the USA Learns web site, we call the ability to communicate in the English language in these situations ‘Life Skills.’ You will practice English language Life Skills in every unit. On this page you will find a sample of some of the Life Skill activities you will practice. If you are studying English as a second language (ESL) because you live in an English speaking country or if you are an ESL student who is planning to travel, you will have to fill out forms in the English language. 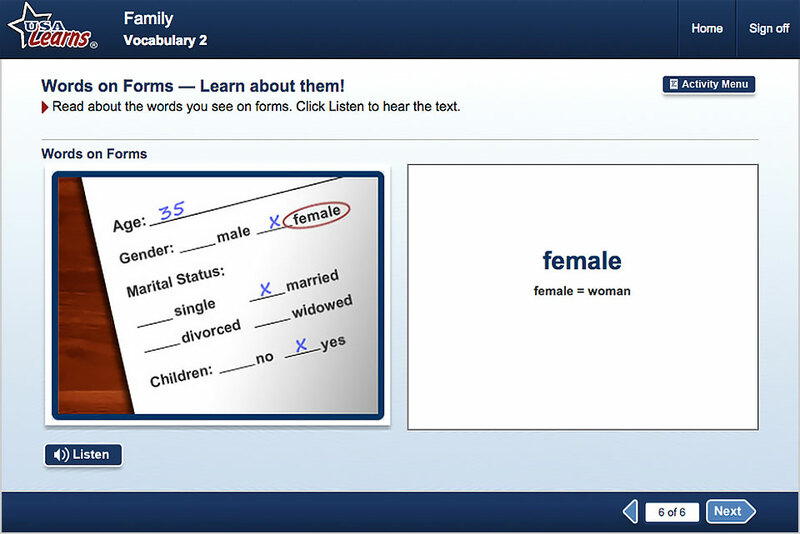 At USA Learns, we prepare you with vocabulary words you will find on those forms. 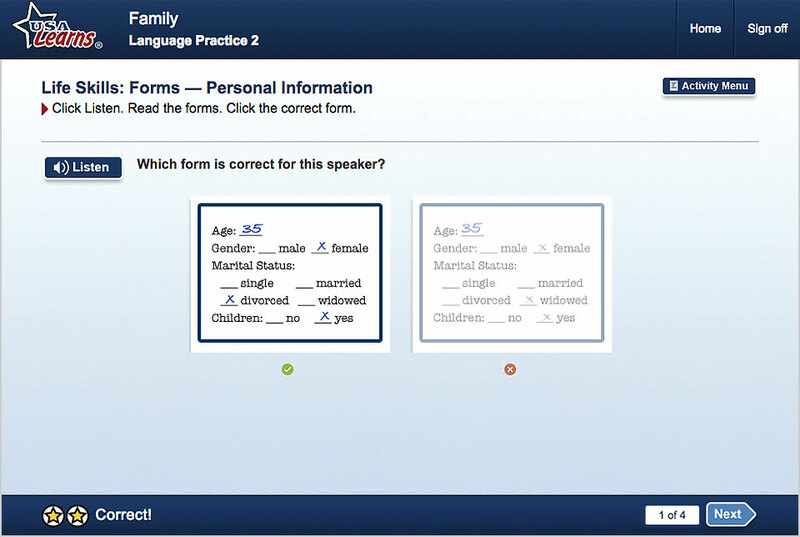 The English language needed to fill out a form may look very different from what is taught in regular ESL classes. Every beginner learns the word woman, but few ESL classes teach the word female, the word used on forms for woman. It’s always important to understand when others use these words in conversations or official questions at an airport. 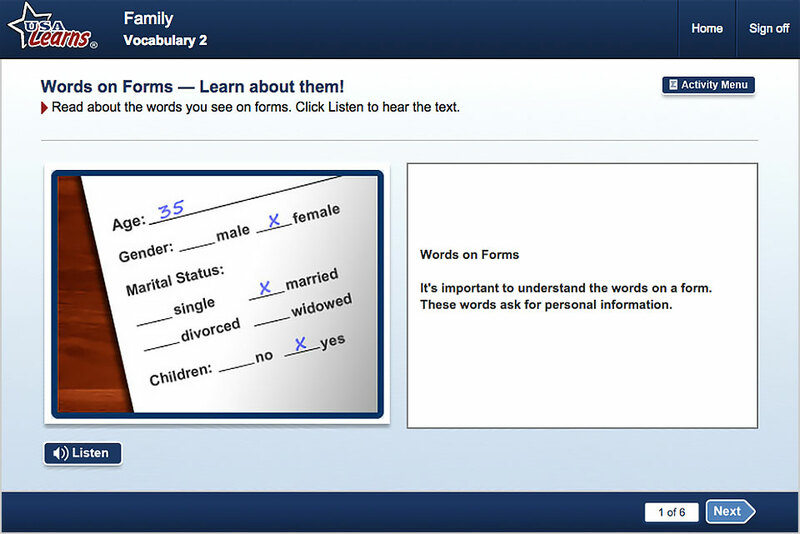 This activity will help you practice your listening comprehension skills with personal information vocabulary words. There are many ways that reading helps you to learn the English language, but reading itself is an important life skill for ESL students. Every day we use reading to get information about the world around us. There are signs on the street. Can you park your car here? Which days? How long? There are letters from school or utility companies that come in the mail. There are also bus schedules, bills, medicine labels, ads, health care pamphlets, and technical manuals for our electronic devices. As an ESL learner, new to a country, this is the first kind of reading you need. 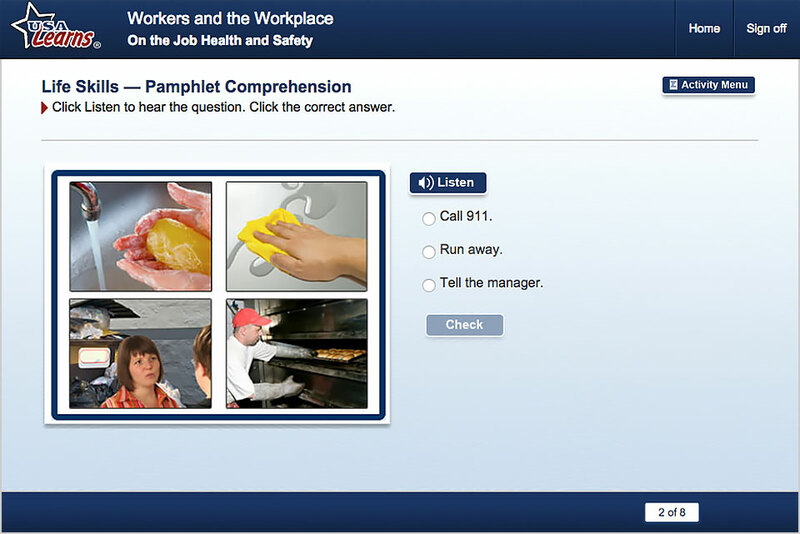 USA Learns will help prepare you with the English language Life Skills reading activities. Viktor and Karina, an ESL couple living in the U.S. learned that English language reading skills are very important when signing an agreement to rent an apartment in one of our 2nd English Course video stories. This is a funny story, but in real life, it’s not funny when you don’t understand what you have to sign. 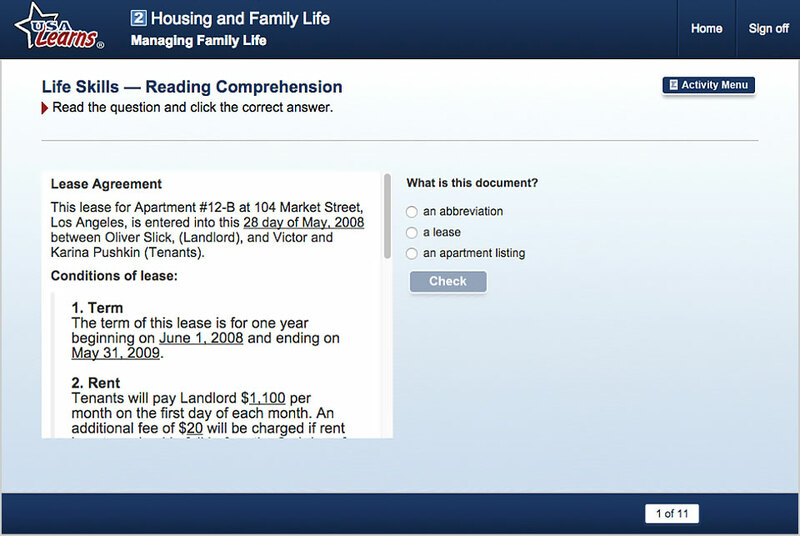 In this activity you will learn about reading details in an apartment lease. It’s very important to understand the labels on all products, but especially medicine labels. Every day we need to write for many different reasons. We may write down a phone number and a message, or write a note, or fill out a form. These are simple tasks in our own language, but they can become very challenging when you have to do them in the English language. If you get information from someone on the phone, you need to understand what the person is saying and transfer that into writing. USA Learns’ Life Skills writing activities prepare you for these kinds of real-world writing tasks. Listen to a phone message and write the message for another person. Many ESL learners say that Listening comprehension is one of the biggest problems when learning the English language. In the ESL courses on USA Learns you will have the opportunity practice listening in the English language on almost every page. In the Life Skills activities in the 2nd English Course, the questions are in an audio file to give you extra practice in listening comprehension. 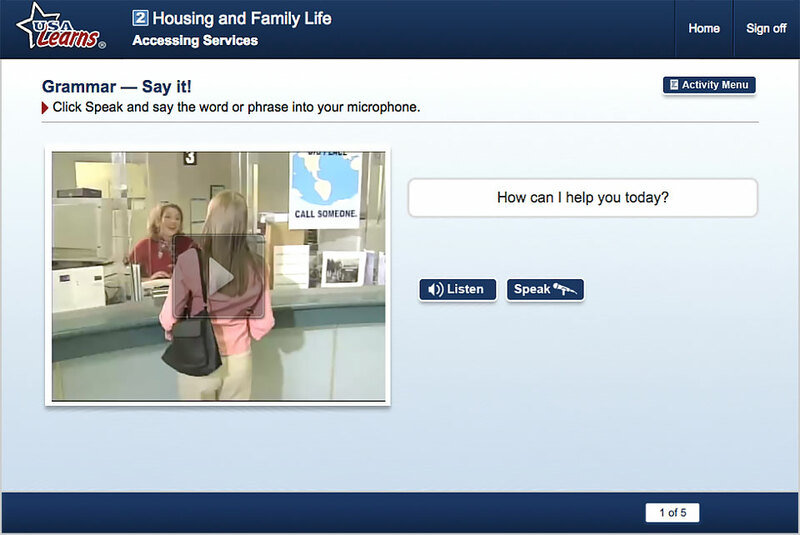 There are also Life Skills listening activities that prepare you for special situations like listening on a phone call. If you call the bank, utility company, airline or any business you normally only get an automated phone recording. It will ask you questions and instruct you to choose different options to communicate what you are calling about. This can be very challenging for someone just learning the English language. 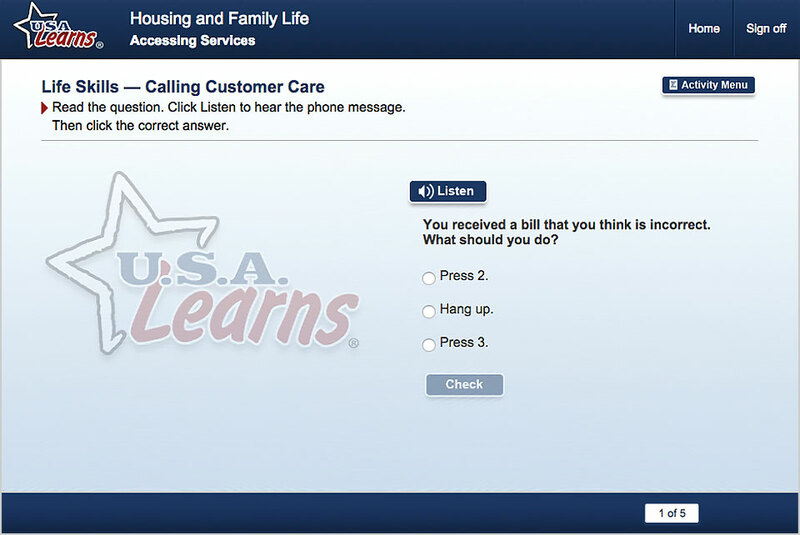 In this USA Learns activity, you practice listening to this type of phone recording and choose the correct answer, depending on what the instructions are. In most situations at work, in the community, or on the road, you will of course have to speak. The ESL courses on USA Learns give the ESL student the opportunity to practice the kind of questions and sentences you need in the English language for these Life Skills situations. Perhaps you would like a job as a Customer Care representative. Practice talking to your future customers! Listen as often as you need to and then speak into the microphone. Try to copy the voice of the native speaker. Click Playback and you can compare your recording the the native speaker. If you don’t like it, you can try again! When you are new to the country you have to set up your household and you need to order and ask for many different kinds of services. 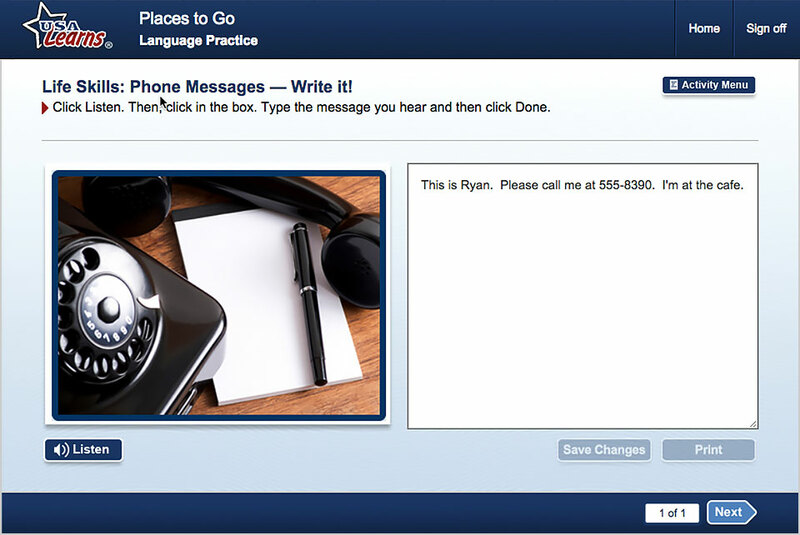 Speaking activities let you practice and give you the confidence to talk when you need to do it in real life. You will also practice speaking in medical situations. 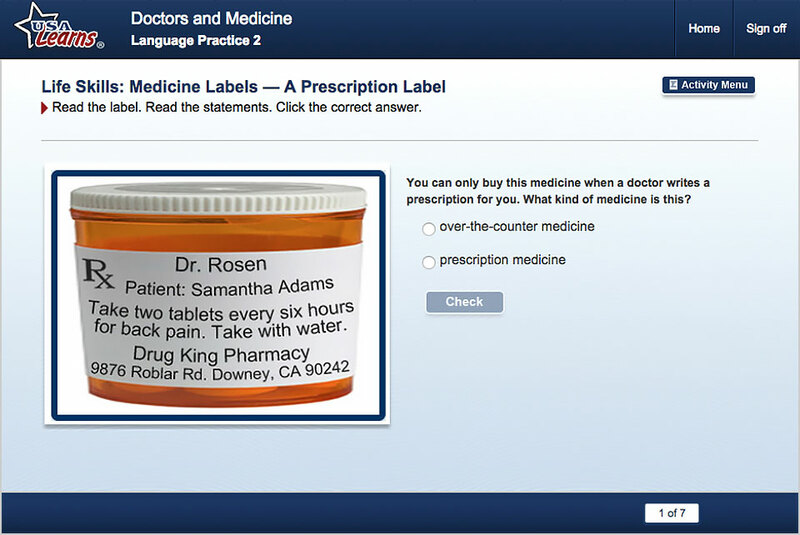 Here is an example of a speaking activity at the pharmacy. You need to tell the pharmacist what your problem is and what you need. 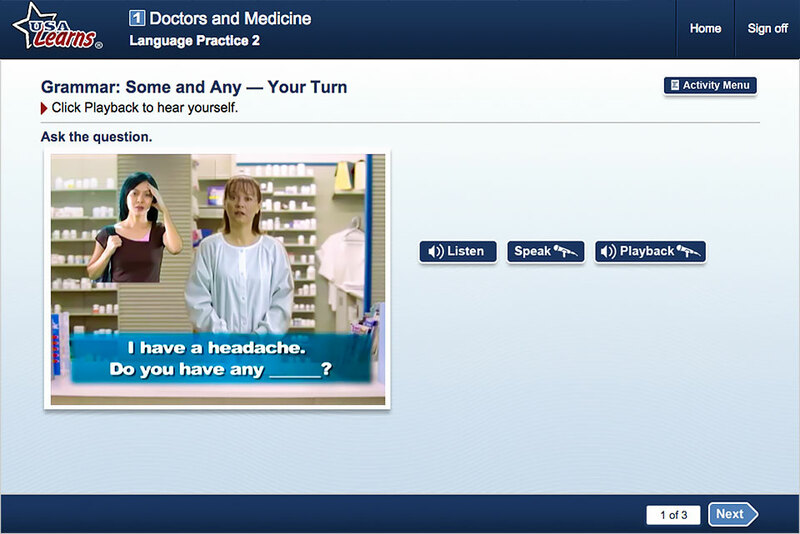 This is just a small sample of the types of activities you will find in the ESL courses on USA Learns. REGISTER NOW to learn ESL life skills for your daily life at USA Learns!